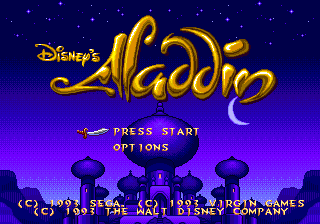 For the 1994 Sega Master System and Sega Game Gear game by Sims and Nexa, see Disney's Aladdin (8-bit). Disney's Aladdin, more commonly known as Aladdin (アラジン) is a platform game developed by Virgin Interactive. It is based on Disney's movie of the same name and was released for the Sega Mega Drive in 1993, before being made for the Amiga, Game Boy, IBM PC and NES. A Game Boy Color version also followed later. Several different Aladdin games exist. An entirely different game was developed by Sims for the Sega Master System and Sega Game Gear was released around the same period, and another version developed by Capcom was created for the Super NES (and later Game Boy Advance). Capcom's version exists as at the time, they held the rights to develop Disney-themed games for Nintendo consoles (or more accurately, the SNES). Most stages are played through as Aladdin, who must get through the stage while accomplishing a task given at the beginning of each level (such as finding Scarab pieces). throws apples (which can be used to hurt enemies and which there is a limited supply of but can be collected throughout the level), swings your sword, and jumps. Before the start of the game, there is a screen showing what each in-game item is used for. If the Abu icon is collected in the level, after completing it a bonus stage will be rewarded where Abu must collect all the falling apples without getting hurt by falling pots too many times to win. If a Genie icon is collected another bonus stage will be rewarded, which is a slot machine-esque game where the player can either get bonus items or lose all remaining spins by stopping on Jafar. Wanting to make a more meaningful contribution to the video game market (as opposed to just licensing out properties, such was the case with Aladdin on the SNES by Capcom), Disney Software were approached by Virgin Games with work-in-progress technology known as "Digicel" - a means of converting frame-by-frame animation cells (used in producing animated films) to a format more suited to video game consoles at the time. As Digicel theoretically allowed Disney to bring its trademark standards of animation to a new market, the company signed up to working in conjunction with Virgin Games on a new product - the Mega Drive version of Aladdin. Work began in in January 1993, with ten of Disney's Florida-based animators producing animations, which were then shipped to Virgin Games' production facility in Irvine, California and digitised for use in-game. Roughly thirty people were involved between the two sites in total, including the film's directors. The teams gave themselves a deadline of October 1993, considered roughly three quarters of the normal time allotted to game development in this era. Disney worked exclusively on character animations (which took nearly eight weeks to produce), with backgrounds being provided by artists at Virgin Games (after being approved). Despite being in production at the same time, no animations are shared between the game and movie, mostly due to the requirement for video game animations to loop. Disney's Aladdin for the Mega Drive is considered to be a milestone for video game graphics, utilising technology known as "Digicel" to bring hand-drawn Disney-style animations to a video game environment. As each frame was drawn individually by professional Disney animators, Aladdin looked significantly better than most other platformers on the market, with visuals comparable to the graphical style as seen in the film. With the exception of unreleased games such as DynoBlaze, no other Mega Drive games utilised the "Digicel" technology, however Aladdin did inspire many similar methods, such as those applied in Shiny Entertainment's Earthworm Jim (comprised of many former Aladdin developers). Other games published by Virgin such as Cool Spot and Mick & Mack as the Global Gladiators share Aladdin's focus on animation, whereas many games such as Pitfall: The Mayan Adventure are considered to be inspired by Aladdin's efforts. The success of Disney's Aladdin gave Virgin Games the opportunity to work with other Disney licenses such as The Jungle Book, The Lion King and Pinocchio. It was also bundled with Mega Drive II systems in Europe. A Sega Mega-CD version was planned for release shortly after the cartridge version, but was scrapped early on in favour of concentrating on The Jungle Book. Aside from text translations, the game is identical in all regions from a content's point of view. The PAL version, like most other Virgin Games releases, was optimized in terms of music speed but not gameplay speed. Forcing the game into 60Hz mode makes the music play too fast. Main article: Disney's Aladdin/Magazine articles. Main article: Disney's Aladdin/Promotional material.